From Pyrenees to Pennines – Page 128 – We went to France ….. and then we came back. ‘Christmas shopping in the snow. A white Christmas. A whiter new year. 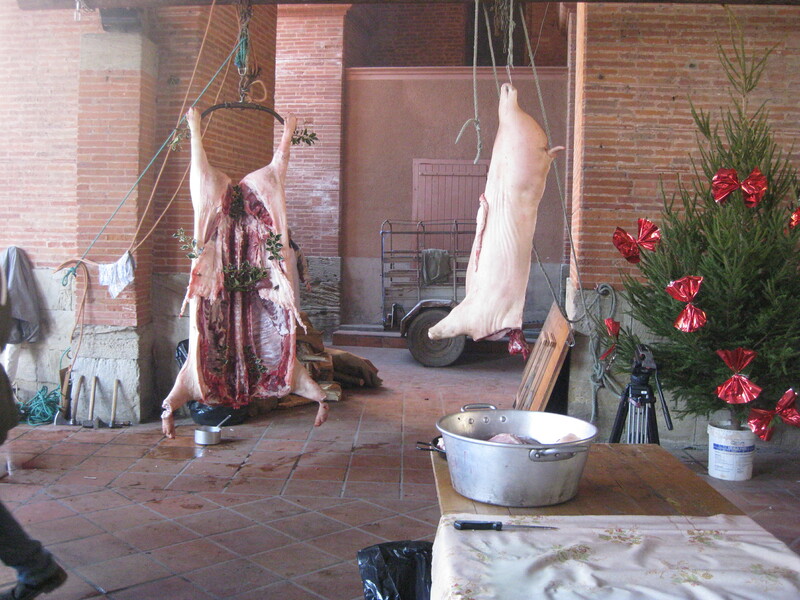 Christmas in the Ariège? No, apparently not. It was mild and sunny there. Instead, this was Christmas and New Year UK style. The days in England were very odd for us. We’d wake up to glittering, powdery snow on the streets, and hungry birds scavenging for crumbs. We’d fail to drive the car up the road, because we live at the bottom of a hill, and the poor thing couldn’t get a grip: 4x4s, usually so derided in our urban setting, had the last laugh, because only they could go anywhere much. Visits to friends were cancelled. Their visits to us were abandoned. All because of the snow. It wasn’t so very deep, admittedly, but in urban and suburban England, we’re just not geared up to dealing with it. No snow chains on the cars, not enough grit, not enough salt. And it’s not so surprising we were unprepared. 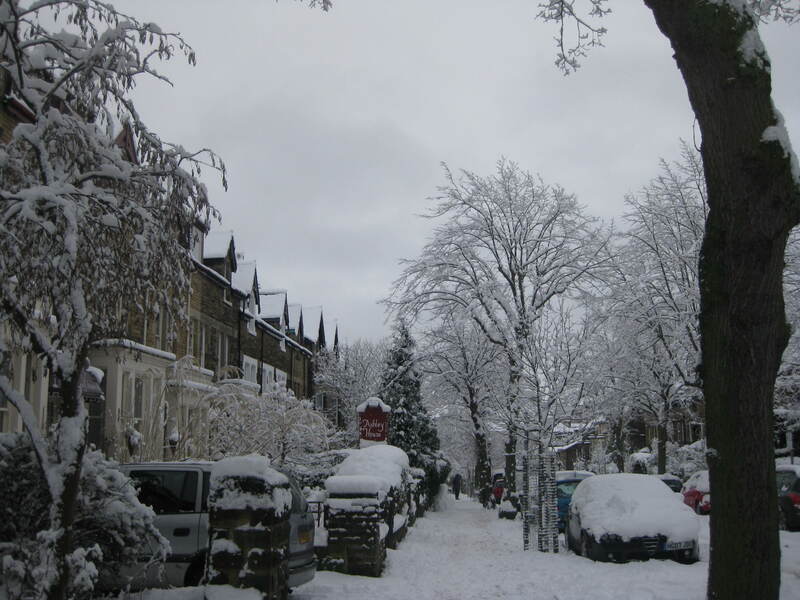 Until last year’s freak snowstorms, many English children had only seen snow on skiing holidays or Christmas cards, so why would local authorities plan for anything worse than the occasional sleet shower? All that was written before The Big Snow. The Big Snow suddenly descended here sometime after 4.00 a.m. on Tuesday 4th January, the day we were due to set off back for France. The Big Snow decided otherwise. Harrogate; like much of Northern England, was closed for business. No buses, no schools, few people at work …. 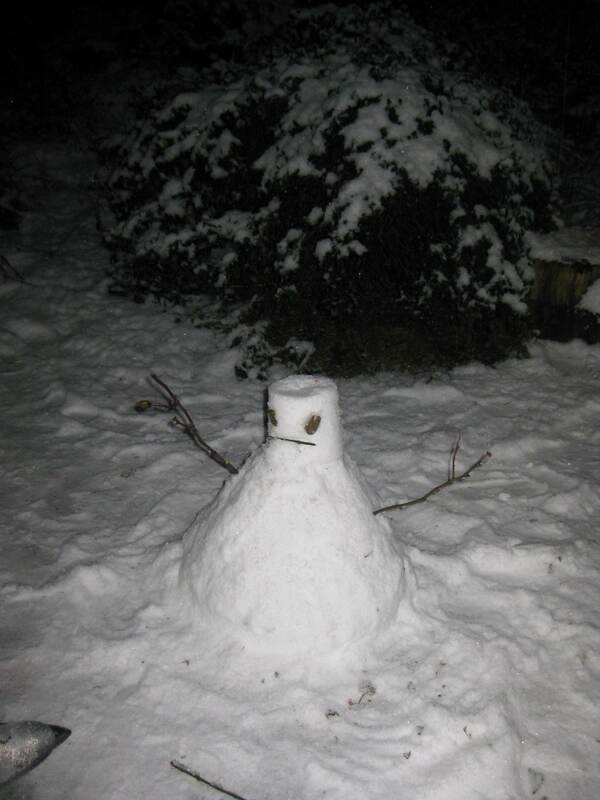 but lots of snowmen suddenly populating the streets and gardens –even an authentic looking igloo in the next street along. It was fun at first, and lovely to look at. Then reality began to bite. Slogging to the distant shops through 8’’ of snow, with streets and roads ungritted isn’t much fun. Not everybody can work from home, and too many of those who couldn’t get to work, either had their wages docked, or had to take a day from their annual leave allowance. There’s still a bit of a holiday atmosphere, but the novelty’s worn off, especially as the Big Snow has become the Big Freeze and is going to continue, it seems. When will we be able to leave for France? Who knows. The South has taken over from the north as Snow Capital of the UK, and we’ve been very firmly advised against travelling (anyway, we still can’t drive the car up our hill). From what we can see, northern France is a winter wonderland as well – with added fog. 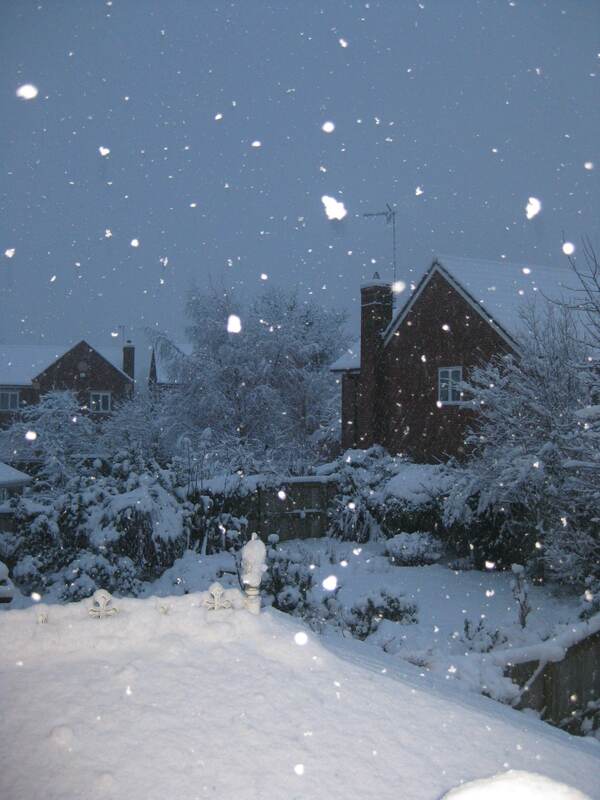 Author margaret21Posted on December 25, 2009 February 4, 2010 Categories AriègeTags AriègeLeave a comment on Happy Christmas! Today has been really good fun. Singing morning and afternoon with four other choirs in a Choral Festival – performing to each other and with each other. And of course after a hard morning’s singing, there’s only one way to spend the hours between 12.00 and 2.00, especially when you have 200 people all gathered together intent on having fun. 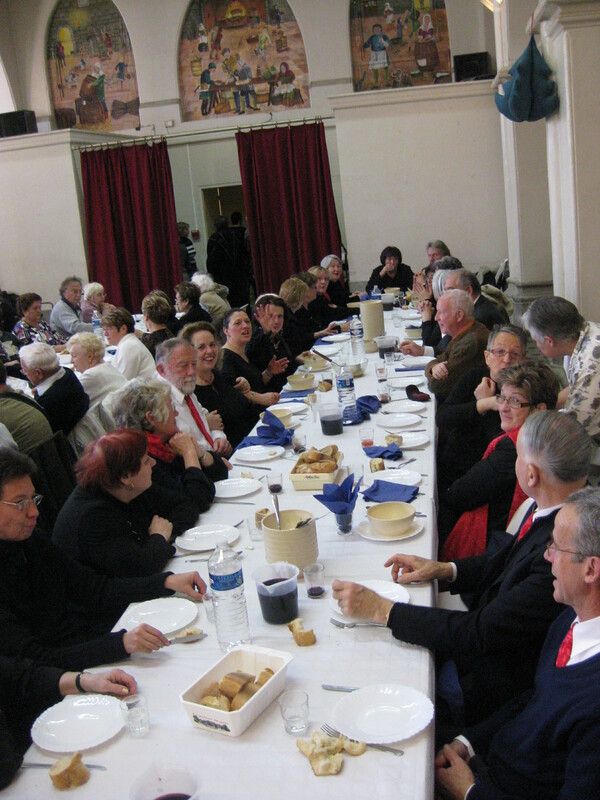 A big community meal, which the town, appreciative of our singing, treated us all to. We were in Mazères, which is on the third day of its Foire au Gras, a celebration of the pleasures of those meats that are so appreciated down here – pork, goose and duck. So forget the vegetarian option. 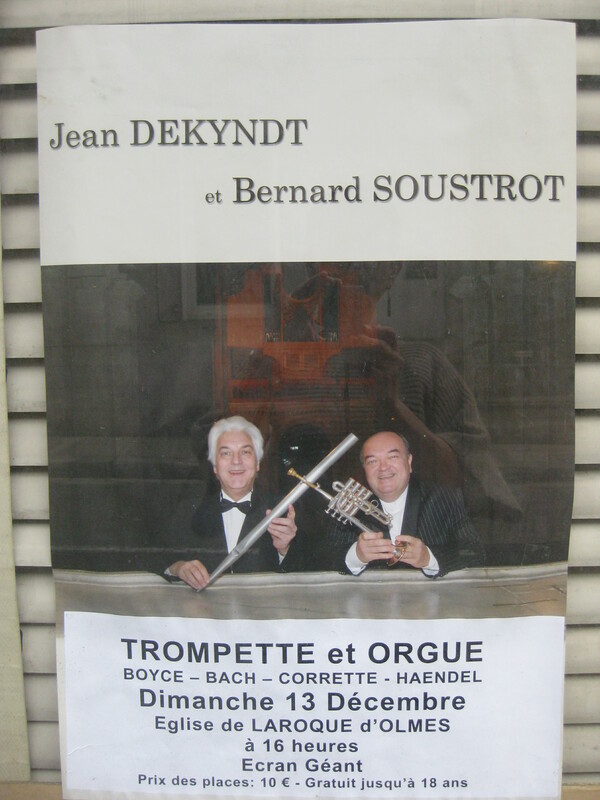 We ate garbure, a deeply meaty vegetable broth, followed by a richly pungent stew with every duck’s leg in the Ariège apparently popped into the pot, and the most delicious plain boiled potatoes I have ever eaten. Perhaps because they weren’t really plain boiled, but cooked in a light flavoursome stock. Kir and red wine a volonté. 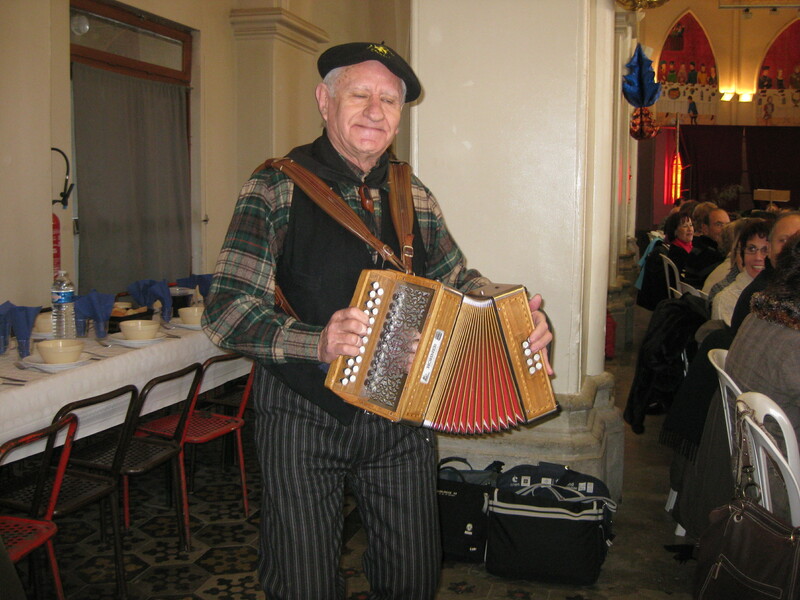 And a great deal of singing and laughter as everyone gave their attention to the accordion player who seems to be at every event we’ve been to. Men and women scuttled up and down the rows of diners, carrying scalding heavy pots, more bread, more wine. It was no surprise to anyone that we began our afternoon session at 3.00, rather than the scheduled 2.30. 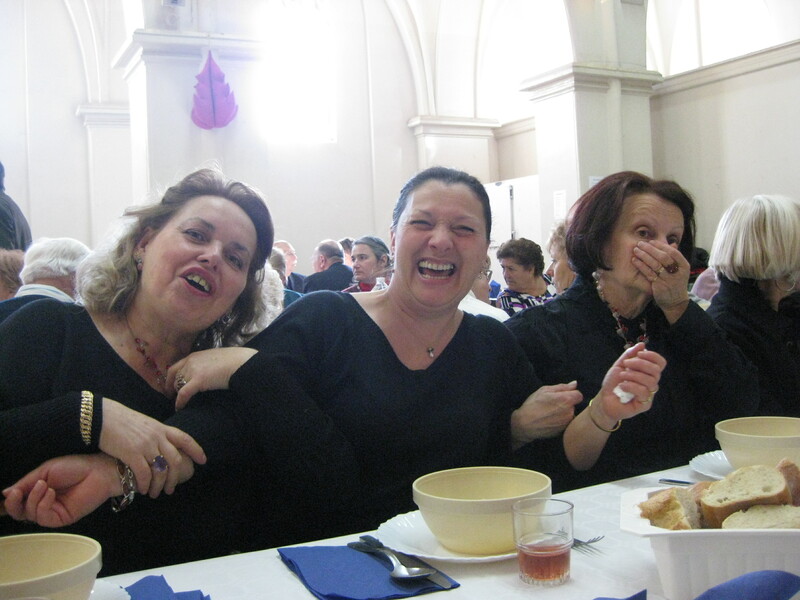 Somehow, however, we all heaved ourselves up from the tables and ambled back to the church, the scene of the concerts. And there we stayed, singing or listening till 6.00 p.m. Some hardy souls stayed on for yet more partying, sharing the ‘pot d’amitié’, but our little group called it a day, and came home, watching the last of the sunset over the Pyrenees as we drove back towards Laroque. Yesterday, the day here in Laroque started with the threat of snow, finally realised this morning. But with our Rando group, we set off for the brighter if bracing Corbières. The Corbières are of course well known for wine production. As our mini-bus reached the area, we saw no cows, sheep, donkeys…or any animals at all. What we did see was acre after acre of vineyards, along the narrow plains, scrambling up the hillsides, with each Domaine favouring a different style of pruning, from the wild and wiry abundance of tendrils clearly being left alone till the spring, to almost knobbly stumps sticking bare out of the ground, scalped of any living shoot. Walking here is so very different from the Ariège. The scrubby garrigue, so reminiscent of Spain, is covered in tough herbs such as rosemary and thyme, tiny wiry green oak trees with richly burnished brown acorns, and olive trees. The soil is sandy, shot through with red ferruginous deposits. There were views of the sea, of distant castles, and of the monastery we’d come to see, Fontfroide. We loved it as a change, but this scenery simply seemed lacking in the variety that our own patch offers – map reading was a nightmare, so we’ll stick with it as a holiday destination, we think. Still, our trek was invigorating in the bright winter sunshine, and it was a good way to spend the morning before an afternoon devoted to cultural matters. 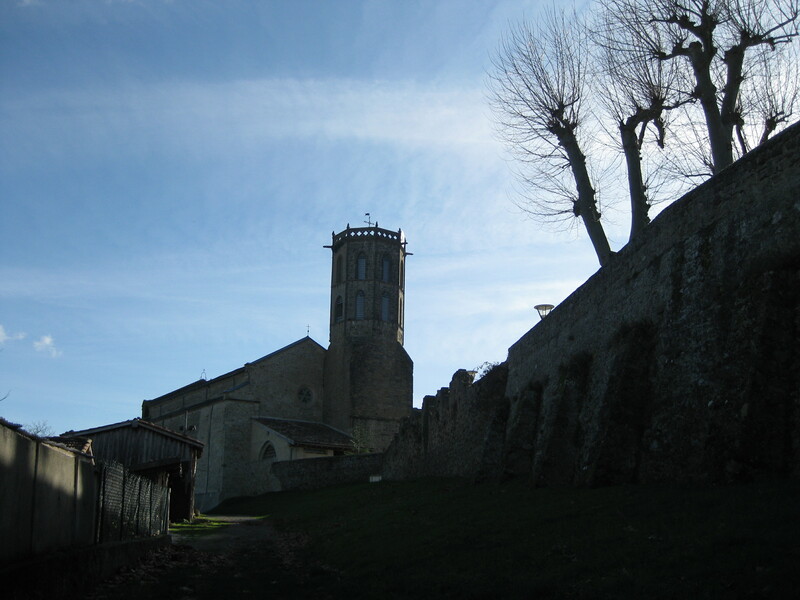 The Abbey of Fontfroide was founded as a Benedictine abbey in 1093 and affiliated with the Cistercians in 1145. It began its history then, as a Romanesque gem, though it was added to in Gothic, Romanesque and elegant 17th and 18th times. It’s been privately owned since it ceased to be a monastery in 1901, and in this last century, accomplished craftspeople have continued to restore and add to it. Quite simply, it is an architectural gem. Right from its early days, the monastery flourished and soon became a centre of orthodoxy. The murder in 1208 of Pierre de Castelnau, a Fontfroide monk and legate to Pope Innocent III, led to the Albigensian Crusade, which is such a living part of our history over here, at nearby Montségur. After peace was restored, construction on Fontfroide Abbey continued. The influence of the abbey soon dominated the entire region, all the way to Catalonia, and a daughter monastery was founded in Poblet. After the Black Death, the monastery had a chequered history, but it always escaped physical damage, and was often added to and improved with taste and elegance. Nowadays, it’s almost unique among Cistercian abbeys in being in such wonderful condition. The Abbey of Fontfroide is an excellent example of the kind of monastic town prescribed by Saint Bernard of Clairvaux, in which the buildings and surrounding gardens and land contain everything necessary for simple living. The monks devoted themselves to hard work and worship, and had no contact with the lay people who worked there too, physically separated from the monastic community. This is only apparent now whenpointed out, but despite the Abbey now being in private hands, many ecclesiastical references remain, especially in the cloisters and church. If you ever have the opportunity, do visit this very special place. This blog is especially for my English readers. 2. You’re in panic mode because you’ve only done some, or worse, none of the above. And he could be right. The street decorations might be switched on in the evening too. Just. It does seem a better way. I really appreciate visiting shops that not only fail to play Jingle-Bells-Dreaming-of-a-White-Christmas on a never-ending loop, but get through the day with no musak at all. Energised by the lack of pre-Christmas stress, I’m actually looking forward to the festival. Deep in the forest, somewhere near here, vanloads of dastardly Italians are despoiling the woodland floor of every single mushroom. Some hours later, they’ve driven back across the border to sell their countless kilos of plunder on some Italian market stall. This tale is a variation of the Great Doryphore Scandal. Elsewhere in France, doryphores are Colorado beetles. 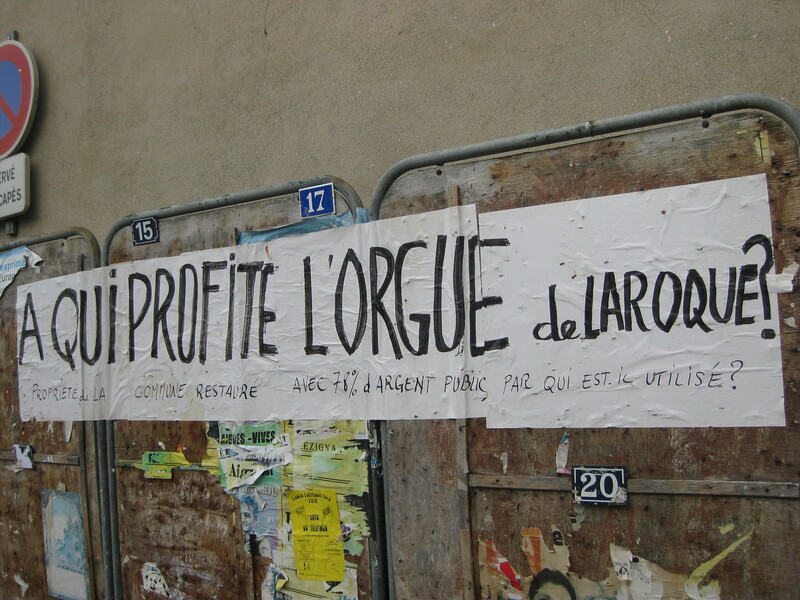 Here in the Ariège, Doryphores are Toulousains, who used to leave the city at dead of night to strip our fields and woodlands of anything edible, returning home before dawn to stock their own larders – or their market places. It was our friend and near neighbour M. Baby who told me the tale of those Italians. We have a great deal of affection and respect for M. and Mme Baby: they’re an elderly couple, very old school, and we’ll never be other than ‘Monsieur’ and ‘Madame’ to them, but they’ve always been very kind to us. Yesterday he reminisced about the secret field where, every year, he used to pick quantities of ceps. He shook his head regretfully. ‘But I’m too old now. I can’t get there any more’. Was he going to tell me, his good neighbour, where to find them? Not a chance. His secret will go with him to his grave. It’s all part of the great Mushroom Mystique here in France. At this time of year, mushrooms are a hot topic. The weather’s too dry, too wet, too hot, too cold…. It’s a poor year. But someone’s always found some somewhere. And they won’t tell you where. ’Ooh, over near Campredon somewhere’ is as good as it gets. Notices appear in the papers forbidding the collection of more than 2 kilos on any one day (2 kilos? I’d be glad of a small basketful). 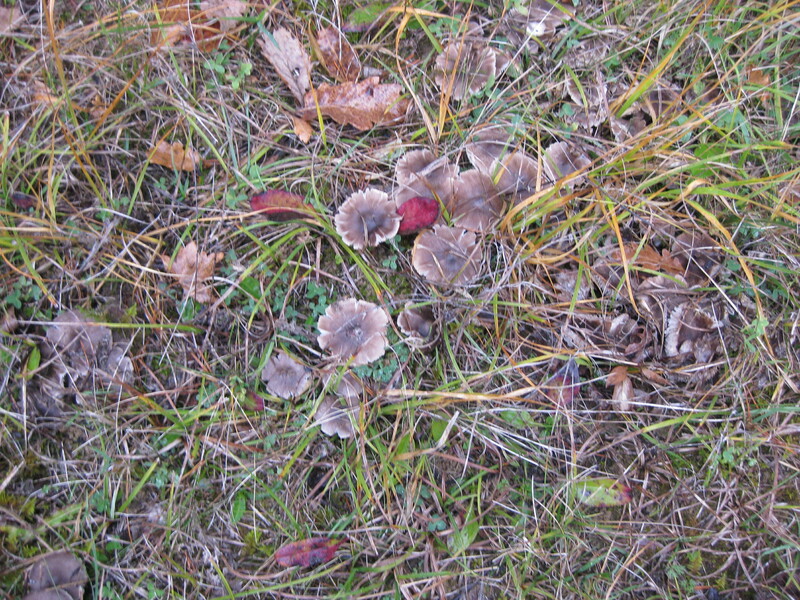 Landowners have permanent notices forbidding the gathering of mushrooms on their land. 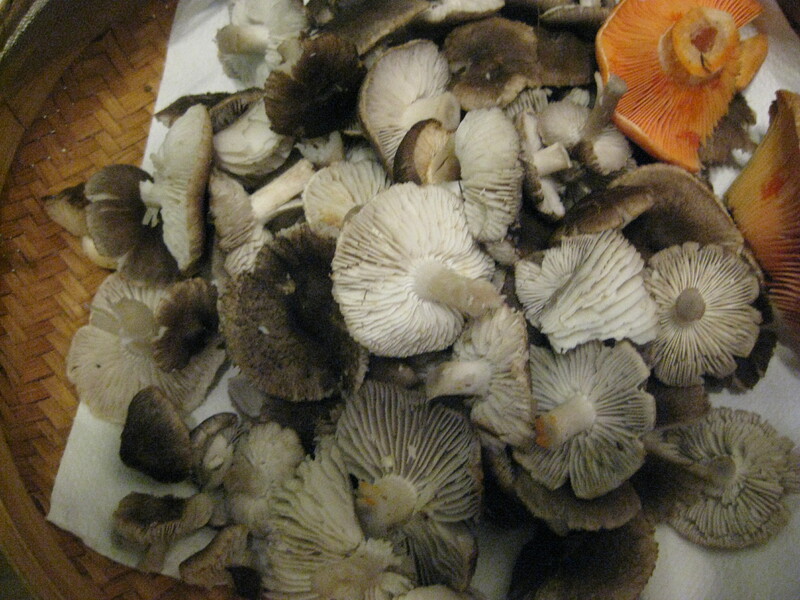 Until now, we’ve had to be content with collecting a few field mushrooms from a rough field just outside Laroque. Yesterday morning though, Henri arrived. ‘Get Malcolm. He’s got to come now. We’re going mushrooming.’ Malcolm was painting the study – he’d just got stuck in really. But invitations like this don’t come twice, so he changed into boots and trousers that were even grottier than those he wears for painting, and off they went, baskets and mushroom knives in hand. They returned, nearly 2 hours later, with a large bag of delicate ‘gris’, so fragile that they crumbled delicately as I excitedly unpacked them. So many! Thank goodness I remembered Kalba’s posting on her wonderful blog Slow Living in the French Pyrénées . She’d had a mushroom glut too, and wrote about duxelle, made by cooking down slowly a mixture of chopped mushrooms, shallots and herbs until there’s a small amount of a sort of paste that is quite simply, essence of mushroom. Slow cooking, but worth it. And Henri was prepared to share with Malcolm where he’d found those mushrooms? We MUST have arrived.